The 80386 initially shipped at 16 MHz with sample quantities in October 1985 and release to manufacture in early 1986. At 16 MHz, it has a higher clock speed than any Intel version of the 80286. Although the ‘386 includes the same addressing modes as the 8086 and ‘286, it also included new addressing modes, including one that emulates multiple 8086 processors and another that works with linear memory space instead of discrete 64 KB chunks of RAM. This architecture forms the foundation of all x86 processors since 1985. The ‘386, later known as the 386 DX, has a 32-bit data bus and was designed using a 1 micron process. It contains 275,000 transistors. The 386 DX is capable of addressing 4 GB of RAM and 64 TB (terabytes) of virtual memory. Perhaps the most significant operating system ever developed on a 386 was Linus Torvald’s port of Unix, which came to be known as Linux. Byte magazine (May 1993) notes that the 16 MHz 80386 has a MIPS (million instructions per second) rating of 5 – and as high as 11.4 at 33 MHz. This is an average of 0.33 MIPS per MHz of clock speed. This indicates that the 386 is up to 50% more powerful than the 0.21 MIPS/MHz rating of the 286, although we must keep in mind that MIPS is not an accurate pedictor of real world CPU performance. 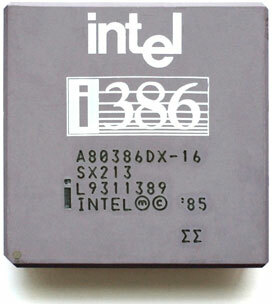 In hopes of killing off the 286, which several different companies manufactured under license, Intel developed the 80838 SX, the same basic CPU as the 386 DX but with a 16-bit data bus and 24-bit address bus, which limited system memory to 16 MB. Intel shipped both the DX and SX in 16, 20, 25, and 33 MHz speeds. AMD pushed its Am386, its clone of the 386, to 40 MHz, where it was fairly competitive with the 20 MHz 486. Great article! One quibble, you imply that OS/2 (2.0) was much later in the game for fully supporting the 80386 compared with Windows/386. That’s not really true. Windows/386 only provided virtual 8086 mode for running multiple DOS environments; it didn’t support 32-bit mode execution. Windows partly went 32-bit with Win32s under version 3.11 and only properly with the arrival of Windows ’95 in late 1995. Moreover, OS/2’s 32-bit environment from version 2.0 was better in the sense that the underlying kernel and APIs were 32-bit, requiring 16-bit APIs to ‘thunk up’ to the kernel. Windows ’95’s underlying kernel was still largely 16-bit, requiring 32-bit APIs to ‘thunk down’ to the kernel and this meant there were still significant 16-bit limitations.